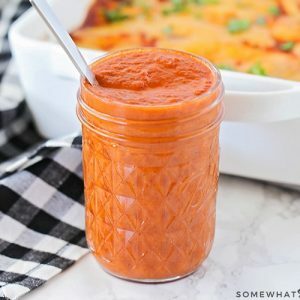 Making homemade enchilada sauce is so quick and easy, and it is the perfect way to punch up the flavor in your favorite Mexican recipes! Heat the oil in a medium saucepan over medium heat. Add the onion and garlic, and cook until softened and fragrant. Add the chili powder, cumin, salt, pepper, and sriracha, and cook 3-5 minutes. Stir in the tomato sauce and water, and bring to a simmer. Simmer five minutes, or until slightly thickened. Puree using an immersion blender or a blender (with the center piece of the lid removed to allow steam to escape). Use immediately or refrigerate until ready to use.